Dimensions: Implementing a Regional Strategy in Social Care using a Fourth Generation Balanced Scorecard. Keywords: Application: Social Services, Social care, Third sector, Regional Strategy, Comparing regional performance, Board reporting, Learning Disabilities. 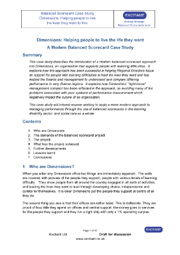 This case study of strategy in social care describes the design, use implementation and use of a fourth generation balanced scorecard at Dimensions. As well as providing insights for those in the social care sector, it provides insights for anyone introducing a strategy roll-out across multiple regions to get ownership and alignment. It will of course interest those with particular interest in the social care sector, and third sector, as a whole. Dimensions is the UK’s second largest provider of outsourced social care services for people with Learning Disabilities. The Board wanted to understand and compare performance across 14 regions so they could assess progress and reward. The management wanted a regional strategy map and balanced scorecard that reflected their strategy, helped Regional Directors to manage their regions better and worked through to the services, ultimately improving the lives of the people they support. Importantly it had to reflect their culture of care with loose-tight management. Oh, and the approach also had to support the integration of forthcoming acquisitions. The approach was so popular, we had spontaneous balanced scorecards breaking out. Regional Directors found the approach so useful that, even before the pilot was finished, other regions started using the approach for their business planning and team development and the pilot regions started cascading the approach to their teams. It was also described as instrumental in bringing the new acquisitions into the Dimensions culture. An unusual aspect of this project was that we had spontaneous balanced scorecards breaking out during the pilot phase and subsequent roll-out. This is an extensive case study of a fourth generation balanced scorecard that can be applied to commercial, public sector and Social Service organisations. This is a video of the case study being described at a conference emphasising the use of judgement and evidence to support learning and development amiongst the Regional Directors and their management teams.